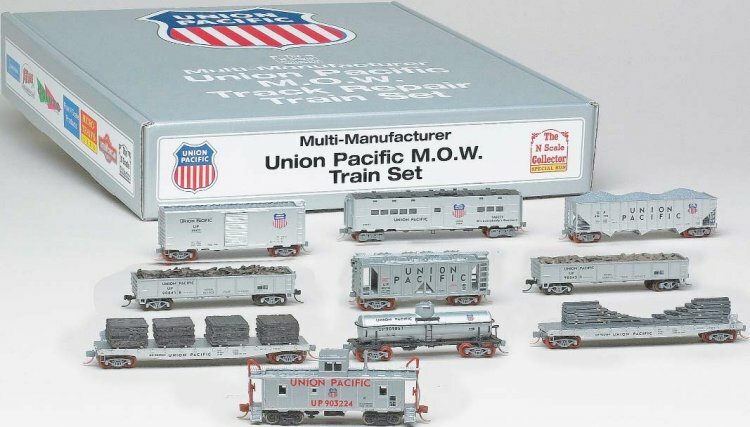 Dear N Scalers: Here are some new items coming from the N Scale Collector. We will only have a small number of each item so order early if you see an item you want. From the cross country routes of today, we present BNSF's latest creation- "the Swoosh Logo". The designers slanted the letters to give the classic indication of a 'Speed Logo', and the results is a beautiful fast moving freight. When BNSF finishes their work, all of their cars will wear this striking new identity. To keep your railroad just as up to date, the NSC has commissioned Intermountain Railway to produce the new paint scheme on their 3 bay covered hoppers. They will have Micro-Trains wheels and couplers as well as etched metal se-thru roof walk. These are absolutely beautiful! "Grain Loading" gives away the type of cargo which these ACF Covered Hoppers hauls on a daily basis throughout the Pacific Northwest. The cars are painted in Glacier Green with a 54" red-black-white herald with white slant-serif lettering. Capacity was 96 1/2 tons or 5,250 cubic feet. The inside length was 53' 3", width of 10' 7" and height of 15' 6". Road number 171250, 171275 and 171281 come from a series of 200 hoppers ordered from ACF. The Great Northern had several hundred hoppers of various body styles earmarked for grain use. Back when the Railroads had more interest in their image to the public, they spent a lot of time and effort on eye-catching paint schemes to raise awareness in the public's mind when it came to choose a travel partner, or a shipping agent. Since the industry has changed (no more passenger or parcel service on the railroads), those days are gone. "What IF?" the passenger trains of the past were still running and advertising their serviceson America's steel freight routes? "What If?" those beautiful blank car sides carried the pride and color of heir owners? These sets are our answer to those "What OF?" questions. Yes, it isn't quite prototypical, but it is representative of what might have been in a better railroad world. We offer these to you, because it's YOUR railroad,and you can create any world you like here in model railroad land. The N Scale Collector Society, in conjunction with New Rail Models, has imported from West Germany, a spectacular early 1900's pepsi Cola truck. pepsi took the plunge with colorful advertising into the 20th Century, by decorating many delivery vans with their red, white and blue logo.